Our World today is progressing at a breakneck speed compared to a decade ago. As such, we are faced with two possible futures, a clean & green future or one of climatic catastrophe. Scientists and environmentalists have warned us constantly that we are heading in the wrong direction. Facilities Management (FM) personnel, therefore, must do their part in changing the course towards a clean and energy efficient future. In our drive to adopt the green initiative, we challenge ourselves to how we can contribute to this herculean task. Like tiny droplets of dew that nourish the ground every morning, we are determined to develop our first green technology product in gradual but concrete steps. One of these steps is by reducing carbon emission/carbon footprint through efficient Cooling Water Management in energy, water, maintenance and chemical savings. One of the ways this can be accomplished is through products that remove water hardness and SiO2 from cooling systems without the need for hazardous chemicals. DeCaIon (DCI) is a way to accomplish this. 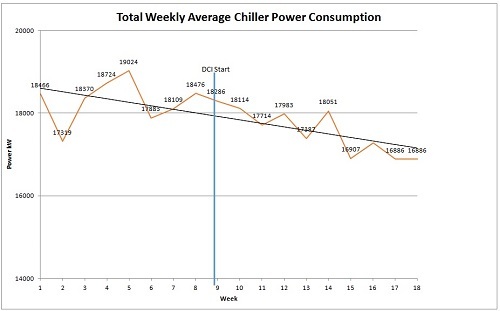 Modern HVAC systems today consume more than 60% of the total power requirements in a building. 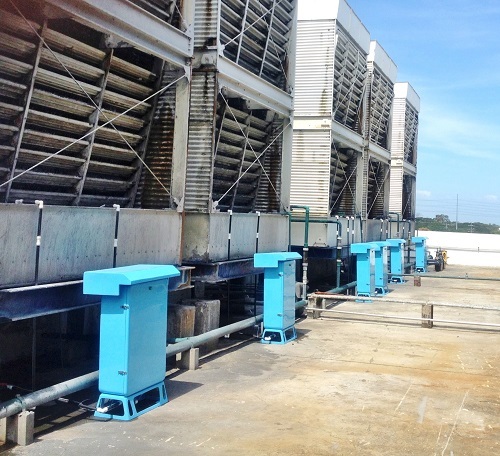 For large buildings with cooling systems greater than 500 RT, the HVAC system by water-cooling tower system is recommended, as it is more energy efficient. Enormous power consumption is also seen in industries; e.g., food processing (fruits, vegetable, meat & seafood) and preservation in a chilled environment. Cooling by evaporation equipment such as cooling towers will increase the solid concentration and results in scaling and corrosion. 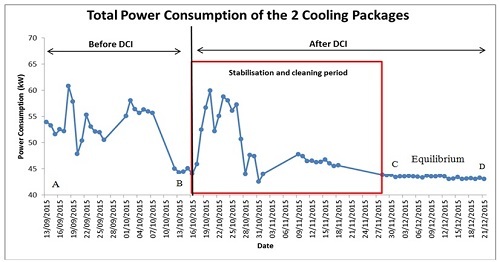 Conventional Cooling Water Management method uses eco-unfriendly 100% chemical approach. But scale deposits still build up on heat exchanger tubes, pipes and cooling towers, which will then require environmentally unfriendly hazardous chemical cleaning and waste disposal. The blow-down containing chemicals from cooling tower pollutes the waterways. On the other hand, pseudo-scientific Non Chemical Devices (NCD) yield unsatisfactory results. This compromised situation cannot be solved by continuing the same practice. 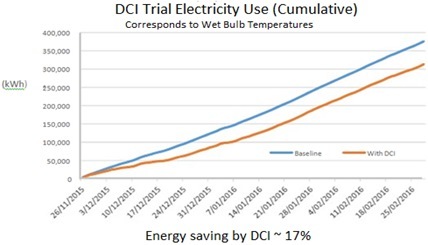 This is why an eco-friendly system such as DeCaIon (DCI) was introduced, as it can circumvent the problems of the above approaches. Every newly commissioned water-cooling tower system is capable of operating within the system specifications. Over time, however, the system performance may deteriorate if not properly maintained, because of scale and corrosion. In a worse-case scenario, the water used for cooling in the water-cooling tower system becomes the incubation pool of legionnaires’ bacteria. In recent years, there were cases of Legionnaires’ disease outbreak claiming fatality in several major cities around the world. To ensure water-cooling tower system is being properly maintained, we first have to understand how water-cooling towers operate. The cooled water in the basin is pumped through the heat exchanger. The cooled water picks up heat and its temperature increases. Warm water is distributed to the spray nozzles at the top of the tower, raining warm water droplets over the fill media below. Fan on top of the tower draws in air passing through the fill media from below. A portion of the warm water will vaporize, cooling the remaining water. The cooled water drips down from the fill media back to the basin. The cycle repeats, where cooled water is pumped through the heat exchanger, and so forth. As the basin water level drops, fresh make-up water is added. Evaporated water leaves behind dissolved impurities from the makeup water, which then concentrate and cause scale, deposits and corrosion. Concentrated impurities in the water-cooling tower are removed through blowing down of tower water to the drain. The basin water level drops due to evaporation and blow-down losses. More makeup water is added to maintain the water level. What Kind of Approach Can Remove Scale without Hazardous Chemicals? The DCI System is a revolutionary approach that will eliminate scale and prevent corrosion and bio-fouling in the cooling water system without chemicals. Bio-mutation, which is a common phenomenon when chemicals are used to kill the microbes, has now become history with the introduction of CataGreen. DeCaIon and CataGreen act in concert to provide a chemical-free approach for cooling water management. In addition, hard, glass-like SiO2 scale can now be removed and prevented. DCI integrates proven Electrochemical Technology with our vast knowledge & practical experience in Water Treatment. DCI is powered by state-of-the-art software design—“DCI Intelligence”. DCI uses proven Electrochemical Technology to dissolve the existing scale from the pipe, cooling tower and heat exchanger, and prevents further scale formation due to evaporation continuously. DCI removes the Dissolved Oxygen in water and creates an alkaline environment. The Oxidation Reduction Potential (ORP) is therefore reduced. Thus protects the tubes/pipes from oxidation. DCI System disinfects water to prevent bio fouling, algae, heterotrophic and Legionella bacteria. DCI is a stand-alone piece of equipment. That is to say the connection does not require any Water Cooling Equipment to be shut down. The pump is piped to the cooling tower and the outlet pipe is connected to the tower basin independently. The pump must be capable of delivering a flow rate between 15 – 20 LPM. The maximum flow rate for DCI system is less than 40 LPM. Water from the cooling tower system is pumped into the Electrolyser chamber where the electrochemical reactions occur. Oxygen and Carbon Dioxide are evolved. Some biocides are also produced. Solid Calcium Carbonates (CaCO3) deposited on Cathode surface. Magnesium (Mg2+) hardness and Silica (SiO2) are also removed in the process. ✓ Bacteria count is well within the required limits. Innovative Polymers Pte Ltd is a Singapore-based company. Besides providing engineering plastic/polymer solutions, it also provides sustainable water treatment technology for cooling water management by DCI, which is a patented device by the company. This device has since gained recognition by Singapore Green Building Council (SGBC). * This article is written by Innovative Polymers Pte Ltd; FMLink is not responsible for the accuracy of its content. Should anyone wish to contact FMLink regarding any article, please e-mail FMLink at support@fmlink.com. Contact information for each organization is provided inside each paper and in the Contact All Providers section under ARTICLES. “Help! My building’s ENERGY STAR® score just dropped!” – What that drop in score means, and how to respond November 18, 2018 In "Sustainability » Leonardo Academy"